I thought it might be fun to dress up the picnic table for July 4th. 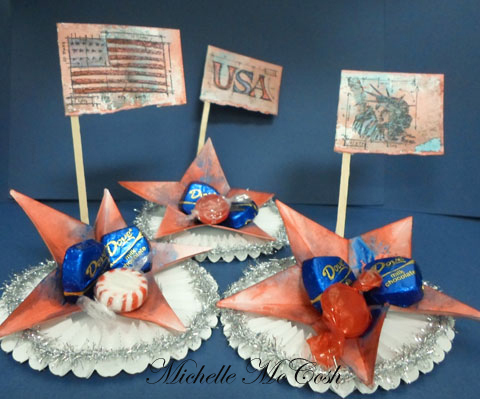 I used the Tim Holtz Alterations die – 3D star to make candy dishes. I turned the star inside out and used the inside of it to hold candies. As a child I was fortunate enough to travel to a lot of wonderful places and countries. I love traveling and seeing new cultures, tasting new foods and sightseeing. Then I bought a store and traveling for me, apart from trade shows, ceased. 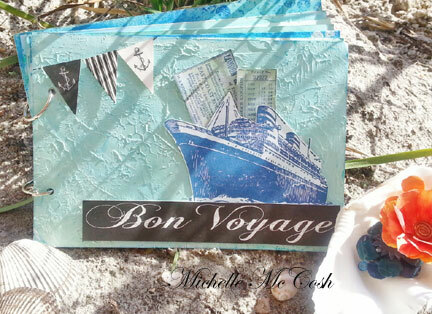 So I jumped on the chance to teach on a Mixed Media Cruise last year. Cheryl Mezzetti asked me to co-teach with her aboard the Royal Caribbean’s Freedom of the Seas. We traveled to St. Thomas. St. Marteen, and Coco Cay in the Bahama’s. We also had three days at sea, which is when we taught classes. 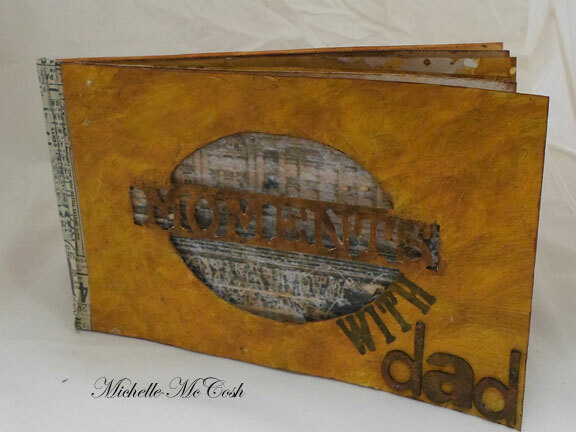 The first class I taught was an Art Journal that could be used as a photo album, travel journal or technique journal. There were different techniques used on each page. Unfortunately I still have to complete the interior of my own album with the souvenir’s I collected. I love to make tags, last year I made a new one every week. This year time seems to have run away from me. This was one of my favorite tags from last year. This was made with book paper and an old atlas for the background. I colored the papers with Distress Inks. 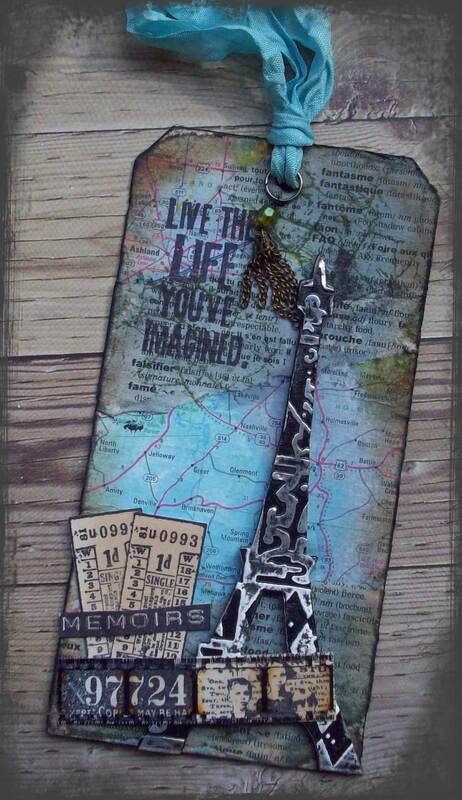 Stamps were from Tim Holtz as well as the Filmstrip ribbon and I also used the Tim Holtz embossing folder on the Ten Seconds studio metal. 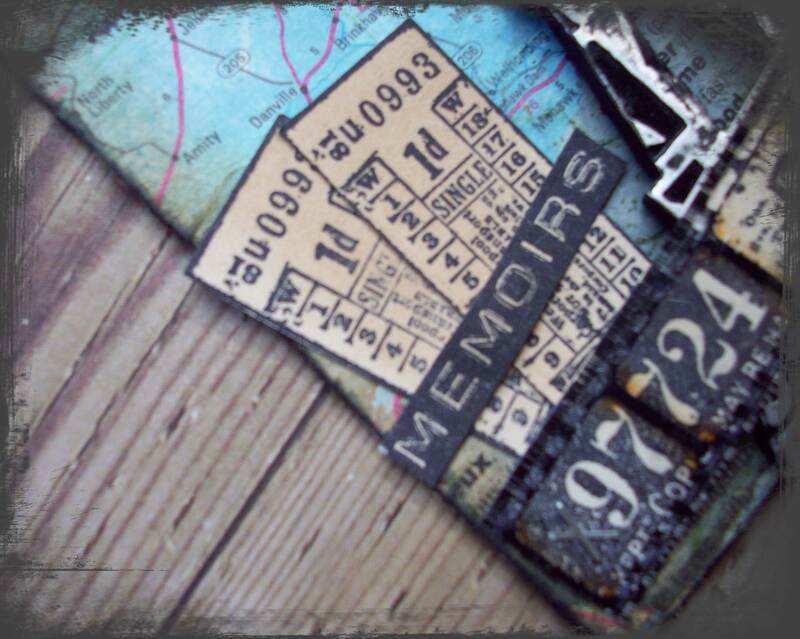 In the last post I mentioned that we also have another Art Journaling class, the A2Z of me. This class is done in a small watercolor Moleskine Journal. We started with the letter I. 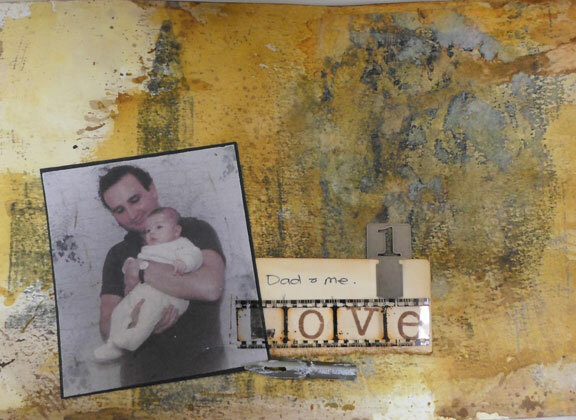 The background was done with Gelatos and Gesso. Archival Ink was used for stamping and a Signo Uniball black pen was used to journal. Each month we randomly pick a letter but skip blank pages so when we have finished the alphabet it will be in order. I love this class, we do a quick background technique and then spend time cutting out imagery, stamping, chatting and hopefully writing. We each pick a word that corresponds with the letter and it is fun seeing what everyone else does to complete their page. I always try to pick a word that is personal to me rather than generic. In June we had the letter “V” but when I sat down to do the journaling I could not remember the word I had picked so I was unable to complete my page. I thought I would start to show some of the images of the Art Journaling classes that we have at the store. We actually have two classes going on every month. Adventures in Art Journaling, this class was the one we started with. We work in a Moleskine notebook. Love this book. Just the right size and I love that the paper is thin. We can always add gesso if we need to. 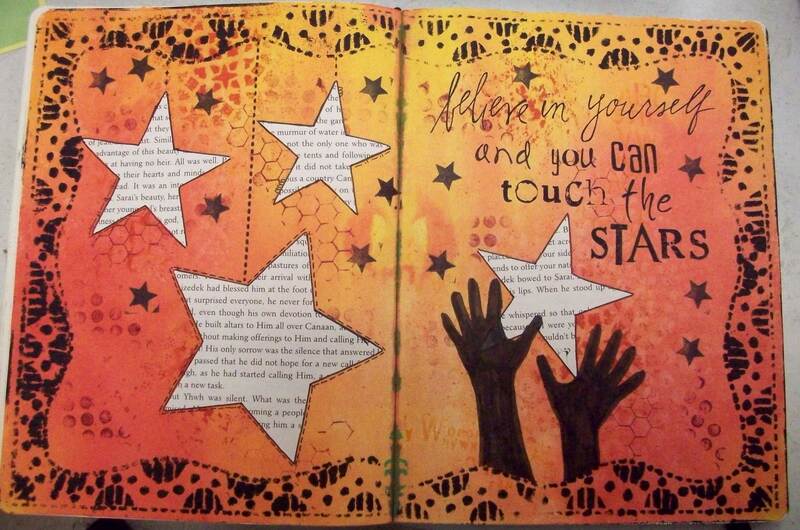 This photo is from the very first Adventures in Art Journaling class back in February 2012. 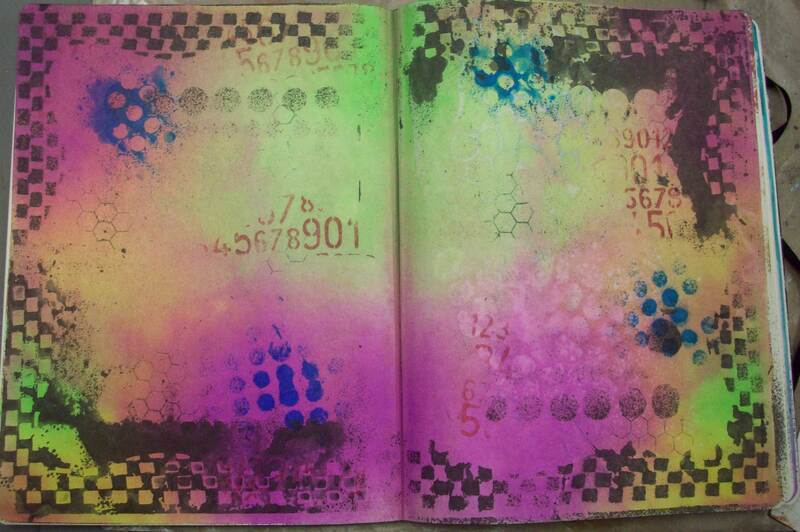 We used Dylusions sprays, stencils, and stamps along with Ranger’s Archival Inks. and we had so many sign ups I repeated the class in the afternoon. This page I finished off with book paper, Faber Castel pitt pens, Ranger’s black gesso, rub-ons and stamps. We have been having so much creative fun in these classes that I have been asked to host a third class, so as soon as I figure out what journal and what theme we are probably going to add it. 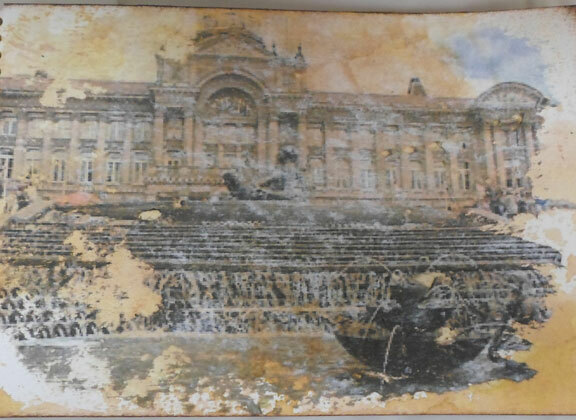 This is the photo image transfer page that you see through the cover of the book. It is from Birmingham, England the town I was born in. the tutorial is up on the Ranger site if you want step by step directions. I am so honored to be on their blog! Thanks Ranger Ink. I had a blog, I still have it, I started it in 2007. It eventually evolved into the stores blog, I found I could not keep up with the daily posts so I handed it over for someone else to write it. Giving up the daily blog posts gave me back some much needed time to run the store and create classes. In time I found that I missed my blog, my little corner of the web where I could sometimes show a piece of art or write something funny. So today I am starting a new blog, just for me, a new beginning . . . .